A restaurant worker punched a female customer three times in the face during a brutal assault caught on camera. 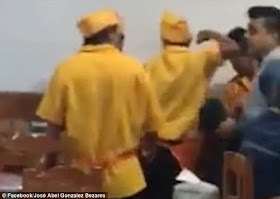 The woman is seen being held back by three employees at the taco eatery in Queretaro, Mexico, after launching a verbal tirade. One of the men pushed her to the ground, but when she got back up and confronted a kitchen worker who then hit her. Customers broke up the fight, but this led to one of the restaurant workers threatening to use a machete, according to Jose Abel Gonzalez, who posted the video online. 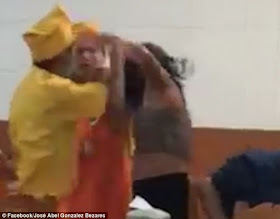 The restaurant - called Taqueria La Guelaguetza - has sacked the employer who hit the customer and disciplined the other two over the incident on Saturday night. The cause of the argument that led to the Mexican restaurant assault is not clear.